The Legislative Fiscal Office is an independent agency created by statute to provide factual and unbiased information to both the House of Representatives and the State Senate. The Office provides assistance to individual legislators, committees of the Legislature and the entire Legislature. Legislators' individual requests are considered confidential and will remain confidential unless otherwise requested. 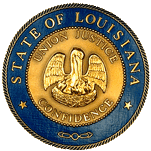 Specific information about the Legislative Fiscal Office can be found in the Louisiana Revised Statutes, RS 24:601 through 24:608. These statutes are available to download in a PDF file. Fiscal Notes are released and published automatically upon final review and electronic signature. Find the fiscal notes on the Louisiana Legislature Website. Use the search to find the bill under the approriate session and click the Notes link. For any problems, suggestions or comments about the website, please send an email to rousseld@legis.la.gov.